Could using a cycle camera improve your safety on the UK’s roads? If you cycle on our roads, how many times have you had a near-miss with a vehicle? It’s highly unlikely that any regular road user could say never. A worrying 22% of cyclists were not seen by car drivers in a study conducted by Direct Line Car Insurance using innovative eye tracking technology. It might come as a surprise that there are more cyclist casualties per year than motorcyclists, as statistics in the 2017 Department for Transport annual report showed. 18,321 casualties for the year means that every single day, a shocking 50 cyclists are injured on the UK’s roads. "Cyclists are hugely vulnerable. Having a camera, if there is an incident, I can do something about it. If a driver is tailgating me, I turn round, and when they see the camera they pull back, so it can also adjust people’s behaviour. Cameras are absolutely critical – if I had gone to the police in these cases it would have been my word against the drivers." This changing of behaviour once you are being observed, known as the Hawthorne effect, can only make for a safer cycling experience, which has to be a good thing. A recent BBC article highlighted the issue about how currently in law, the burden of proof rests on cyclists’ shoulders when they have been in a collision with a vehicle. Cycle camera footage, whilst not automatically being acceptable to the courts, could help in many cases. Police forces across the country are also working on initiatives to make the roads safer for cyclists. This is much needed, with a Westminster University study called the Near Miss Project suggesting that incidents occurred every 10 - 20 miles. 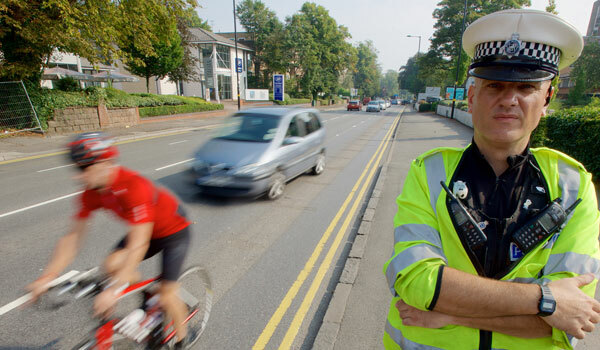 In 2016, the West Midlands Police pioneered a new initiative called Operation Close Pass. This has been hugely successful since its launch, reducing the reports of close passes by half, whilst during the same period the number of serious injuries and deaths reduced by 20%. “Drivers who endanger vulnerable road users need to understand that we run operations to catch them… and if they avoid our officers we can still prosecute them using footage provided by cyclists and other motorists”. For cyclists who have to deal with inconsiderate driving almost every time they use the roads, this should come as welcome news. With cycling safety cameras being more mainstream now, and having a wide range of features, it can be somewhat daunting as to which option to go for. The first major consideration is the mounting type/place, which can be either head or frame mount. Here you have to decide which is best for you, as they both have benefits and disadvantages. For example, head mounted cameras mean you need to look at the action, which can be an issue, and the footage is going to be constantly moving. The flip side is that if you are separated from your bike, the footage will still be relevant - always assuming you are still able to look in the right place. Possibly another benefit to having a head mounted cam is that vehicles should be able to tell you have one fitted as they approach, certainly more easily than they would see a frame mounted cam. As mentioned above, this alone can improve a driver’s behaviour. For the image-conscious, the look of wearing a head cam can be less appealing, but most serious cyclists will value their safety over this. We did manage to find one option that solves this issue, so whilst not strictly being a cycle camera, we have added it for the sake of completeness; see the end of the article for this very interesting new product. The next big decision is the direction of camera. This can be front facing only, rear only or both. We would always go for both if it is within your budget, but if cost is an issue, it makes sense to go with front facing. A close pass incident should show up as the vehicle goes by (not to mention your audio will probably be quite descriptive!). Water and dirt ingress - will your camera work well in the rain? Battery life - how long is your average journey; will the battery life be sufficient? Viewing angle - will the range of view be sufficient? Sound recording - does the device have an integrated mic? Profile - bullet style or GoPro? Lastly, please note that the prices quoted are those from the manufacturer, and that often by shopping around a better deal can be obtained. The links below take you to the product pages so that you can get more information. As we wished to remain independent with our opinions, no commission is payable on anything - so please go wherever you can get the best deal! 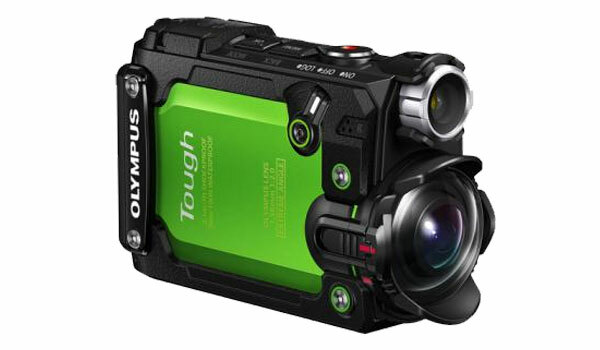 The Olympus TG-Tracker is packed with sensors, including GPS, electronic compass, accelerometer, thermometer and manometer. This means if you are interested, there is a wealth of information that you can access. Be mindful though, as the more gadgets used, the faster the battery will deplete. At £179, this is a keenly priced camera that can be used for much more than just safety. There is also a flip out screen for quick and easy viewing, but it’s a shame it doesn’t tilt, as this makes it harder to get the correct angle. 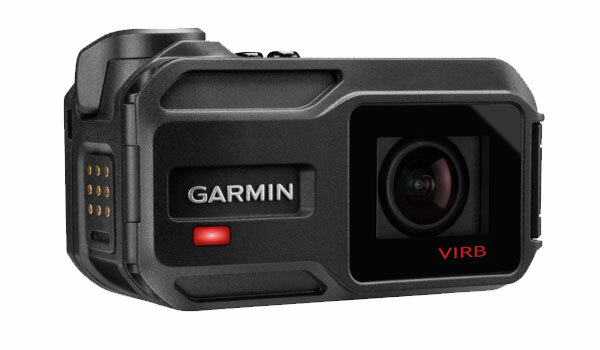 The Virb XE is the latest Garmin action camera and is a totally new model as opposed to being a next generation of the VIRB Elite. The VIRB XE takes a leaf out of the GoPro book and opts for a non bullet-like camera. This might be an issue if you prefer bullet types, and some may say it can add to wind resistance. At £349 the VIRB XE from Garmin is at the higher end of the cameras assessed, being a Garmin model, has ANT+® compatible, meaning it is more efficient with wireless connections. This boils down to a longer battery life. The Fly12 is bigger than a GoPro Hero 3, but does include a 600 lumen light, which in spotlight form is equivalent to approximately 50 watts. So from a safety point of view, you will be easy to spot! Having said that, using the light at full power does have a corresponding detrimental effect on the battery life, as you might expect. The app, available both on iOS and Android, allows for a multitude of options to be accessed, with a nice interface. As with the VIRB XE, the camera is ANT+® compatible, so again, it is power efficient (with the same caveat as above for the light usage). 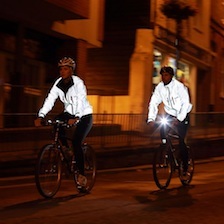 At £255, it’s a great option with you only needing the one device for both camera and headlight. There is also loop recording, so your camera will never stop recording. Although quite a large unit, you have to take into account the fact you don’t need a separate light unit, which will be a big plus point for many. 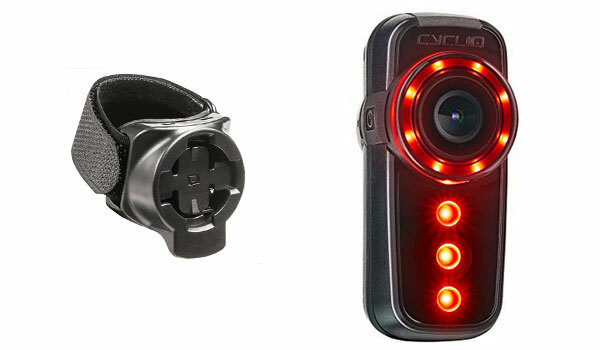 As we covered the Cycliq Fly12, we can’t leave out the Fly6, Cycliq’s partner light/camera combo for the rear facing option. The device has a 100 lumen lamp (red) for the rear facing aspect and has a 135 degree viewing angle and image stabilisation built in. As with the Cyclic12, it’s easily mountable and has a quick release for security. There can’t be a camera roundup without featuring a Sony. 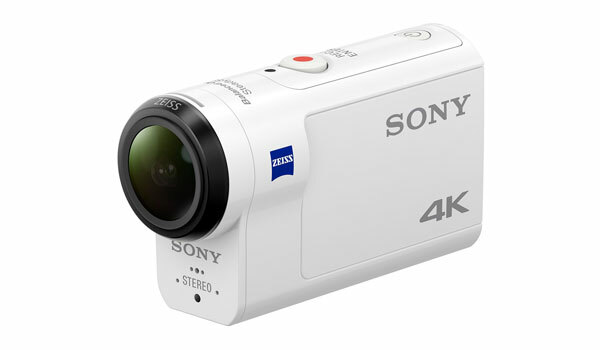 Enter the Sony FDR-X300 with Zeiss lens and Balanced Optical Steadyshot. The FDR-X300 is compact and lightweight coming in at 114g and easily fits in the palm of your hand. The image stabilisation and quality is great and tests show it has very little fisheye distortion with very smooth footage. 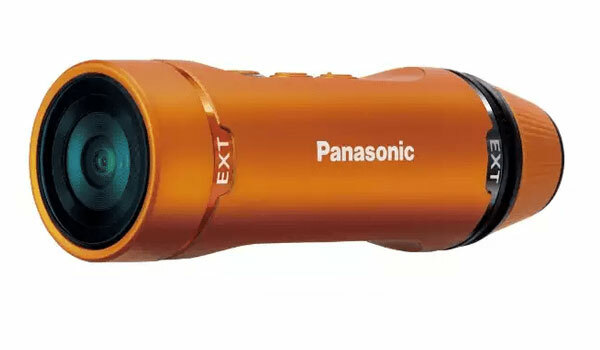 The Panasonic HX-A1 comes in a black or vivid orange design with high spec IP68 ingress protection (dust & water) to 1.5m. It has a wide operating temperature meaning it could easily double up as an action cam for skiing. High performance water and dust proofing. 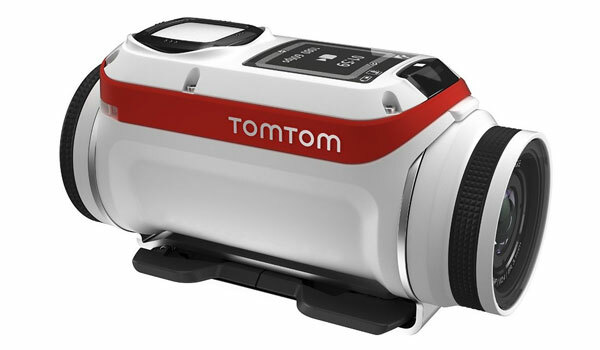 Whilst being best known for their GPS navigation devices, the TomTom Bandit is a good high spec video camera, with additional features like GPS, several motion sensors and a really easy way of getting footage off the the Bandit. 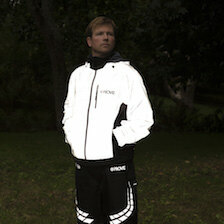 With it being a striking white and red it stands out and may let other road users see you are recording. One of the best features is its ease of connectivity with the app, allowing you to get easy and quick access to footage including editing, if you want to make action compilations. 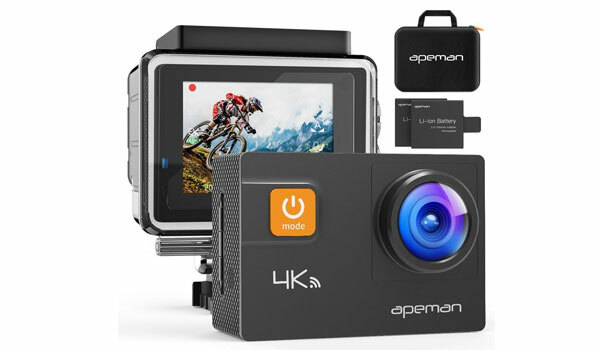 If some of the suggestions above are a little out of your budget, we have experience of the Apeman brand, who have GoPro-type features but at great prices. It has to be better to have something rather than nothing, so do check out the Apeman range if you don’t feel able to splash out right now. Their products seem to offer a good alternative to brands such as GoPro. Would you like to have eyes in the back of your head? How useful would that be in many situations?! 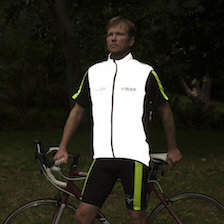 Ok, so whilst it’s not literally possible, the founders of Cyclevision have done the next best thing. This is more of a heads-up as to what is becoming available, rather than an option to buy right now, but during our research we found this clever idea, and thought you may be interested. It makes perfect sense really… why couldn’t you have two cameras incorporated into your actual helmet, and then have the rear facing one stream straight to your handlebar-mounted smartphone? 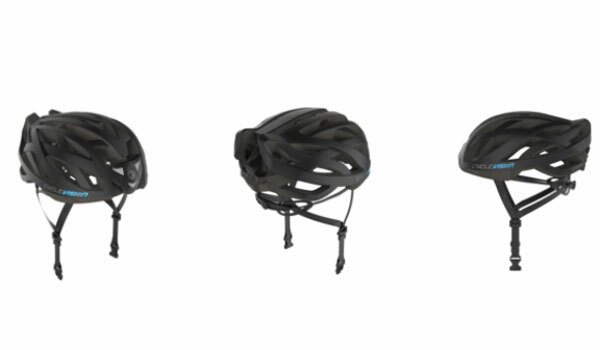 With many more features and still being in its final production stages at the time of writing, we think this patent pending helmet has the potential to take the cycle cam market by storm… you read it here first! 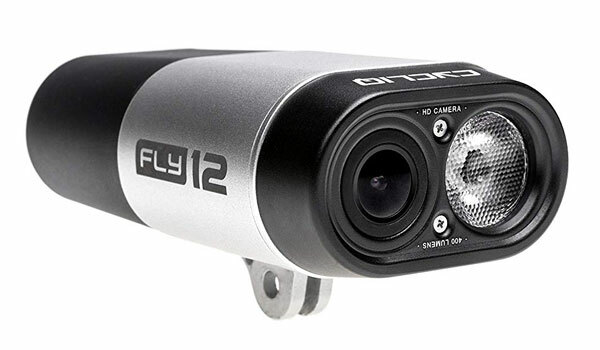 We hope we have given you some ideas to think about, and a headstart in choosing the best cycle cam to suit your needs. There are so many to choose from, it’s true... just please don’t get bogged down by the huge range and do nothing. With more cars than ever on the road, and people always wanting to get wherever they are going ‘yesterday’, anything you can do to improve your safety must be worth investing in. Note: in case you missed it above - we have not been paid by any of the manufacturers we’ve mentioned in our report, so we can say with integrity that for us, our choice is the Cycliq12 and 6 purchased as a pair. This is because of their high-level spec, the all-round protection they give, and because they incorporate lights, which are a must for when it’s dark or raining… something that happens quite a bit here! 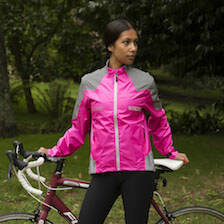 Whichever you choose, be seen and stay safe.